Whether you're an adult serving up spooky cocktails with creepy crawly garnishes at a swanky costume party, or you're throwing a kids party for your little ones with adorable goodie bags filled with your favorite candies (save all the peanut butter cups for me, please! ), a photo booth would be the perfect addition to all the fun! We've never seen a sad person in our booth (well, except for the cranky toddler who was up past his bed time!) so we thought we'd share some fun ideas for a custom backdrop that is sure to be the hit of your party! Make your own paper fans out of your favorite scrapbook paper, or go the less time intensive route and run by a local craft store like Michael's or Hobby Lobby to pick up a few packages of paper fans. Make everyone think your party think you rented out a whole pumpkin patch! This wall tapestry is easy to hang and would make a big statement. Create a cool sitting booth for parties with lots of small children. Parents won't get tired of lifting their children up so the camera can see them, and kids will enjoy being able to stand tall on top of the hay bales! 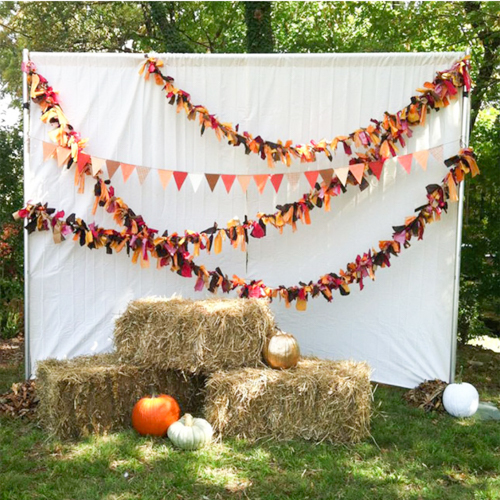 Use a solid color backdrop with fall-themed banners to bring out the fall spirit. 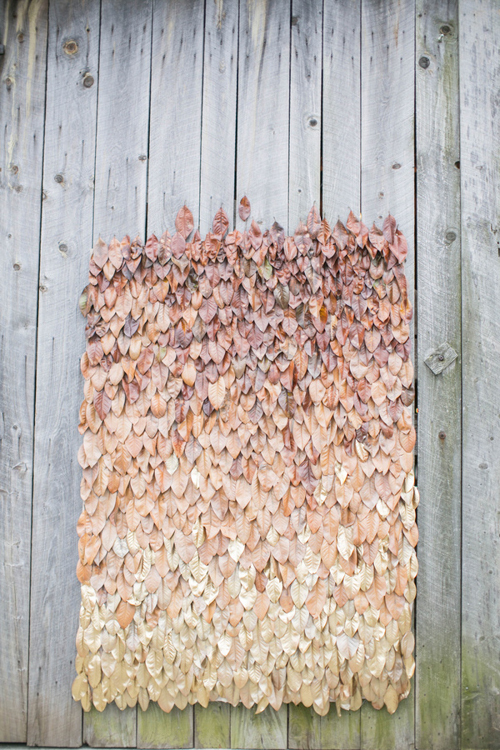 Nothing says fall like changing leaves! Ruie + Grace absolutely nailed it with this leafy backdrop, and we think it would be incredible for a photo booth. They used browning leaves, and spray painted some of them gold to mix in for a gorgeous metallic pop! Raise the bar on the glam factor of your party by including a rich-colored velvet sofa paired with spooky accessories like a birdcage, a witch's broom, old books and lots of pumpkins! You can rent furniture like this from a couple of our favorite rental companies in Austin: Birch and Brass, Bee Lavish and Loot Vintage. Hopefully this got your creative juices flowing if a Halloween party is in your future this month! If you are planning an Austin party this October, give us a call! We still have some availability, and we’d love to be a part of the fun!